Saudi Aramco's own SPE chapter was named the recipient of the 2016 President's Award for Section Excellence. The company itself received a recognition certificate for its principal sponsorship of the ATCE in Dubai — the first time the ATCE had been held in the Middle East. In addition, president and CEO Amin Nasser and Upstream senior vice president Mohammed Y. Al Qahtani were given appreciation awards for their participation as keynote speakers on the opening day of the three-day event. As the leading upstream producer in the oil industry, Saudi Aramco plays a major role in sponsoring the SPE and its chapters throughout the Kingdom. The SPE is the industry’s top professional organization for oil and gas professionals. With more than 7,000 international oil and gas industry leaders and professionals from around the globe attending the meeting, the event was an opportunity for learning and collaboration and to showcase the latest technologies being implemented by the company. 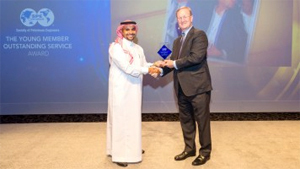 The company’s own SPE chapter, the SPE-Kingdom of Saudi Arabia Section (SPE-KSA), was named the recipient of the 2016 President’s Award for Section Excellence. 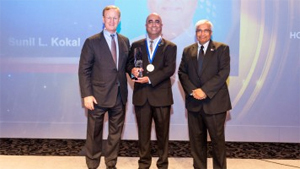 EXPEC Advanced Research Center (ARC) principal professional Sunil Kokal was awarded the 2016 SPE Honorary Membership Award — the highest honor the SPE presents to an individual. Honorary membership represents those individuals who have given outstanding service to SPE and have demonstrated distinguished scientific and/or engineering achievements in the fields within the technical scope of the SPE. Kokal was awarded for his significant technical contributions in reservoir engineering and his professional activities serving the society. Kokal, who has provided technical leadership and relentless professional service to the SPE for more than 30 years, is a pioneer in improved and enhanced oil recovery, and is the enhanced oil recovery focus area champion at EXPEC ARC, based in Dhahran. 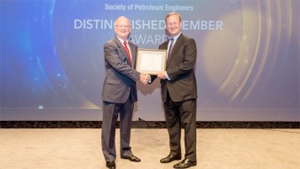 The SPE honored David Kersey, senior petroleum engineering consultant, with the SPE Distinguished Membership. Kersey was recognized for technical contributions and volunteer service. During his years as an SPE member, Kersey has published more than 80 technical papers and served as chairman of the Indonesia and Saudi Arabia sections. Under Al-Khamies’ leadership, the section conducted 160 events attended by 20,000 participants and won the 2015 President Award for Section Excellence, the Most Active Section Award, and the Ambassador Lecturer Program Award.